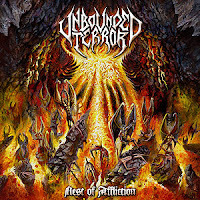 As one of the plenty of one album bands of the old school death metal era, Unbounded Terror strenghtened the Spanish underground scene. Or better to say as one of the first bands in the genre, they belonged to the founders of the scene in Spain. "Nest of Affliction" is rich in influences, and covers most usual parameters of the genre. The common mid speed with simple basic themes and effective atmospheric parts may remind to the oldest heralds of extreme metal (like Celtic Frost), and with the occasional slow downs their music turns closer to death/doom. There is no lack of speed though, but the edgeless sound taking the effect of their intensity. This way their music gives the same impression like British od Swedish death metal bands. Deep growling vocals are assisting, but they also losing from their harshness, and sounded more like deep murmurring. Fortunately the re-release solved the problems, and the highly increased the albums enjoyable level. It has great themes and spirit, and became a remarkable classic of the early '90s death metal scene.